HARARE, Zimbabwe — The death toll from a huge cyclone that hit Malawi, Mozambique and Zimbabwe last week stood at 150 on Sunday, with hundreds more missing and tens of thousands of others stranded and cut off from roads and telephones in mainly poor, rural areas, officials said. The cyclone, called Idai, has affected more than 1.5 million people in the three southern African countries, according to the United Nations and government officials. The port city of Beira in Mozambique was hit the hardest, with the airport closed, electricity cut and many homes destroyed. The storm hit Beira late Thursday and moved west into Zimbabwe and Malawi, affecting thousands more, particularly in areas bordering Mozambique. Homes, schools, businesses, hospitals and police stations have been destroyed by the cyclone. Thousands of people who were marooned by the heavy flooding abandoned their possessions to seek safety on higher ground. United Nations agencies and the Red Cross were helping with rescue efforts, including delivering food supplies and medicines by helicopter. President Filipe Nyusi of Mozambique said that the damage was “very worrisome” and that the flooding made it difficult for aircraft to land and carry out rescue operations, according to the country’s state-run radio. In Zimbabwe, at least 31 people have died from the floods, according to the government. The deaths were mainly in Chimanimani, a mountainous area along the eastern border with Mozambique that is popular with tourists. No tourist deaths were recorded, a government spokesman, Nick Mangwana, said. Roads and bridges were swept away, slowing rescue efforts by the military, government agencies and nongovernmental organizations, Mr. Mangwana added. The dead included two students who were among dozens of children trapped in a dormitory after a rockfall, according to Mr. Mangwana. The Zimbabwean military was trying to rescue the 197 other students at the school, but unsafe conditions were forcing the soldiers to go by ground rather than attempt an air rescue, the Ministry of Information said. “We are receiving tragic reports of some people being swept away. We urge patience as rescue is on its way,” the Ministry of Information said on Twitter. Power cuts and communications breakdown in affected areas meant that the advice might have reached just a few residents. Zimbabwe’s state-run television station, ZBC, reported that 150 people were missing. 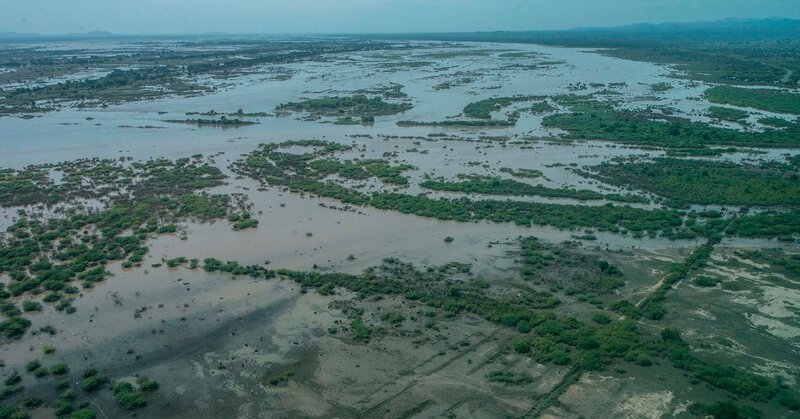 In Malawi, people “are now facing a second threat of flash floods” after the cyclone, the International Federation of Red Cross and Red Crescent Societies posted on Twitter. South Africa’s military sent aircraft and 10 medical personnel to help in Mozambique and Malawi, it said in a statement on Saturday.